The Chevrolet Celebrity Eurosport was meant to offer buyers a modern sporty sedan with European flair. 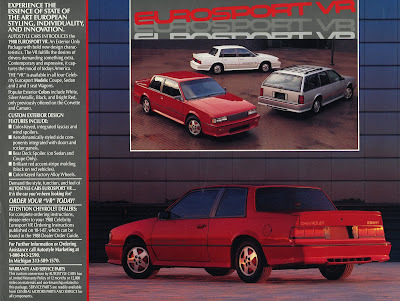 But if GM's conventional cookie-cutter styling wasn't quite sporty enough you could step up to the Eurosport VR. I have no idea what "VR" stands for but women in red tights enjoy staring disdainfully at it. But who couldn't when the Eurosport VR "fulfills the desires of drivers demanding.. something contemporary and expressive". Hit the jump for all the details. 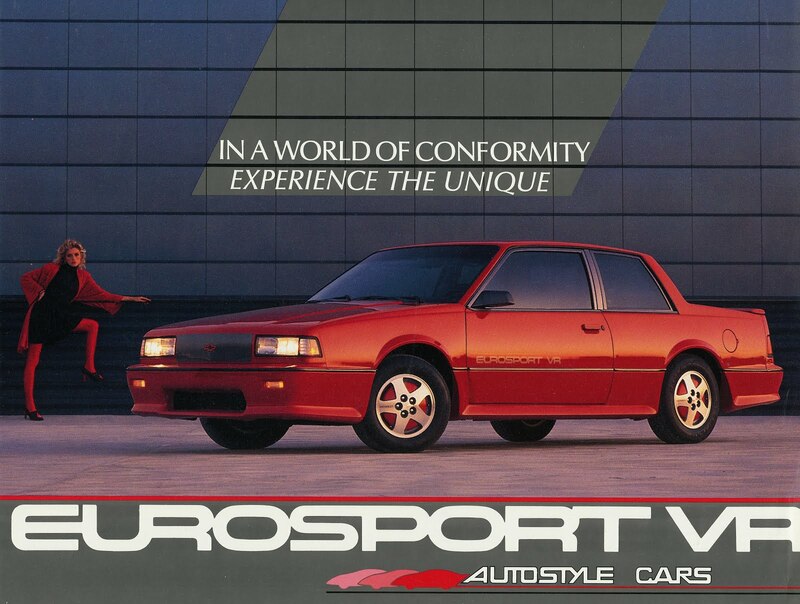 This leaflet from 1988 is the second model year Chevrolet offered Autosytle Cars' Eurosport VR directly through dealers. The 1987 is even more desirable as it offered VR unique interior details which included red carpets, special door panels, and bolstered bucket seats. For 1988, Chevy dropped the unique interior. I do enjoy the tag line "In a world of conformity experience the unique". As someone who spent years behind the wheel of a Celebrity I can tell you its the epitome of conformity. Adding ground effects does not change this. At the age of 16, my father handed me the keys to a grey on grey 1988 Celebrity CL. 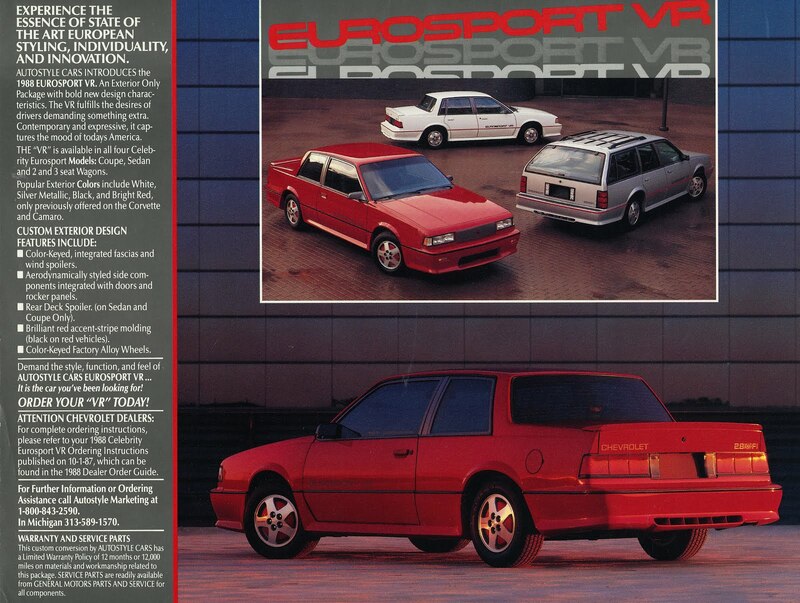 While my CL didn't have the sporting character of the Eurosport it was the embodiment of 1980's GM mediocrity for me. The cookie cutter styling, overly plush bench seat, overly light steering, and rectangular speedometer that was almost unreadable forced me to go out and buy a Merkur XR4Ti. In its defense the Celebrity was reliable and although the Iron Duke four cylinder clacked like a diesel, it ran great. Interesting trivia: GM offered its A-body cars with two different wheel bolt patterns, the larger of which also received vented front brake rotors. The Eurosport option could be ordered separately from the upgraded brakes leaving some Eurospots with solid non-vented front brake rotors. Wow, that video is amazing. Its been too long since I've heard some great 1980's synthesizers while cars slowly drive in formation around a race track.